It is my pleasure to welcome all distinguished guests and participants to this gathering being the 2018 National Insurance Conference organised under the auspices of the Insurance Industry Consultative Council (IICC). First, I want to register our appreciation to our special guests and every one seated here for finding the time to honour our invitation notwithstanding your respective busy schedules. It is heartwarming to see this array of frontline professionals and high caliber of guests that cut across different sectors of the economy joining us at this conference to discuss insurance and how best to harness its enormous potentials to enhance its contribution to the nation’s Gross Domestic Product, GDP. On behalf of every stakeholder in the Nigerian Insurance Industry, I welcome you all to this very significant conference. Let me also recognise those who were saddled with the responsibility of organizing this conference especially, for their choice of the Conference theme: “Insurance Industry and Financial Inclusion”. The theme clearly reflects the direction the industry is headed which is the retail end of the market. The timing of this Conference could not have been more significant especially as we prepare to launch the Nigerian Insurance Industry Development Plan (NIIDP) which has Financial Inclusion as one of its major components. Work on the NIIDP has already been concluded with inputs from KPMG, a consulting firm who will also independently monitor its implementation to ensure each segment of the market keep to date with their assigned responsibilities. It may interest you to know that the plan has been presented to the Insurers Committee, a body comprising management of NAICOM, CEOs of insurance companies and heads of insurance trade associations and the Chartered Insurance Institute of Nigeria (CIIN) to ensure every player in the industry is on the same page with us. I commend the market committee and KPMG for the good job on the NIIDP. As we may all already be aware, financial inclusion is premised on the principles of equity (i.e. social cohesion and bridging the gap in income equality) and inclusive economic growth & development. It is a global objective which has different dimension since countries and institutions are wont to develop models that will best suit their peculiar environment. But irrespective of the jurisdiction, the general consensus seems to be that financial exclusion is one of the main causes of poverty in the world. How the insurance sector in Nigeria could effectively and efficiently navigate this turn to increase the number of policyholders while reducing the figure of the financially excluded, are part of what the NIIDP contain. The strategic initiatives and implementation plans of the NIIDP notwithstanding, we have dedicated this forum to financial inclusion for an opportunity to listen to speakers and discussants with divergent views and opinions so as to improve on what we already have. Thus, we find in Mr. Jim Ovia, a perfect speaker to share his knowledge and experience on our theme paper for this conference, not only because he is an erudite speaker or because of his pedigree as a successful businessman. Jim’s vision gave birth to one of the leading banking brand in this country which has now spread internationally. The selection committee said they decided to invite Jim based on their realisation of how his brand has captured retail banking space and how tactfully he wooed a partner with a world leading retail Insurance heritage to capture the financially excluded segment of the Nigerian insurance consumer. We are optimistic that at the end of this conference, we would have provided more insight towards bridging the gap between the financially included and excluded groups in the insurance sector, develop new research agenda, set standards for promoting best practices to improve financial inclusion, and build a safe and sound insurance system. In 2012, Nigeria launched the National Financial Inclusion Strategy (NFIS) to reduce the percentage of adults that are excluded from financial services from 46.3% in 2010 to 20% in 2020. The strategic goals are driven by a broad range of coordinated interventions, including simplified Know Your Customer (KYC) regulations, Agent banking, Microinsurance and Consumer Protection principles. The insurance sector plays a vital role in all of these because it helps to reduce the poverty line, it helps entities and individuals manage their risks and protects them from negative adverse effects of unforeseeable events. NAICOM then developed and launched the Micro Insurance and Takaful Operational Guidelines, consequences of these, Insurance companies were permitted to offer the relevant products through “the window” models of operation. Upon gathering some experience the Commission reviewed the guidelines and upscaled the operations to specialist and dedicated licensing to entice specialist operators from within and without the Insurance industry. This has been a tremendous success as we have now licensed two such Takaful operators with another three at various conclusion stages. We have also concluded the process to license two such micro insurance operators with four other applications near conclusion. It is instructive to mention that majority of these applications were from outside the mainstream Insurance providers. Not long ago, the Commission also entered into a collaboration and signed a Memorandum of Understanding with the Central Bank of Nigeria (CBN) on Bancassurance as a channel for increasing access to insurance products via the banking platforms. Both apex regulators have since issued respective guidelines to their regulated entities in this regards. The Commission has so far granted approval to six (6) insurance companies to transact in Bancassurance while the applications of six (6) others are at different levels of approval. this opportunity to once again implore more insurance companies to take advantage of this window and participate in the scheme. IBAI will help in providing financial support to rural and smallholders’ farmers since financial institutions will give out loans to people that have IBAI policy, hence reduce the financial pressure on farmers in case of unexpected threats that may result into lager losses. The introduction of these new products and services created new challenges especially in the areas of capacity and expertise. To bridge these identified gaps, NAICOM conceptualized and consummated series of agreements with local and international bodies to assist in building capacity and expertise in the industry. In the area of Microinsurance, NAICOM has been working with Deutsche Gesellschaft fur Internationale Zusammenarbeit Gmbh, GIZ of Germany and our own Enhancing Financial Innovation & Access (EFInA). The relationship with these two bodies have culminated in a well-documented diagnostic study of the Nigerian market, several seminars, workshops and trainings on Microinsurance for both operators and staff of NAICOM and the industry at large. In December 2017, the Commission went a step further and invited the Toronto Center, Canada to conduct a training session in Abuja for insurance operators and regulators in the West- African Sub-Region. We have also partnered in the recent past with Islamic Finance Service Board (IFSB) based in Malaysia and arranged trainings in Nigeria by bringing in expertise from yonder to train our operators and staff in the field of Islamic financial services. 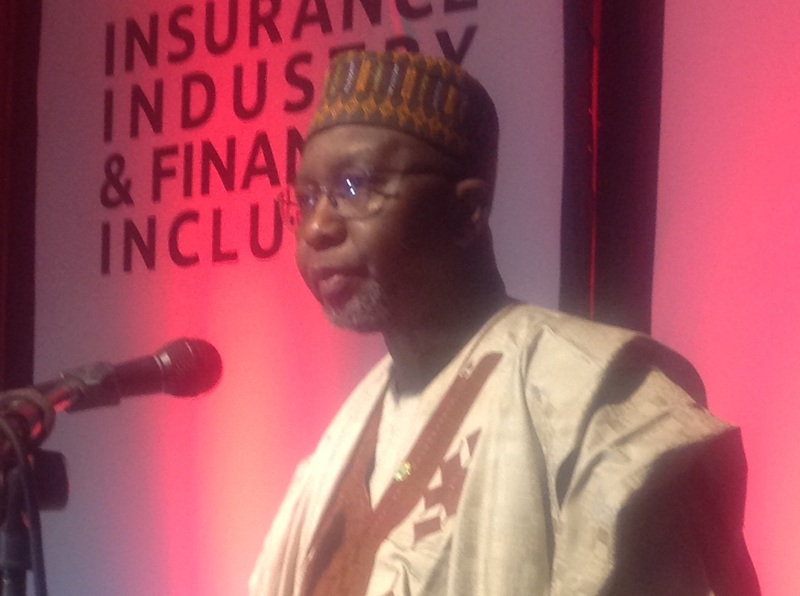 To ensure the sector takes maximum advantage of the benefits on offer under IBAI, NAICOM in collaboration with the World Bank Group – the Global Index Insurance Facility (GIIF), International Finance Corporation (IFC) and the African Reinsurance Corporation (African-Re) organised series of trainings for operators, regulators and end-users. The two of such trainings were held Abuja and Lagos already with the representatives of Federal Ministries of Finance, Agriculture, CBN, NIRSAL, Insurers and NAICOM in attendance. These initiatives have been supported by the liberalisation of distribution channels and the current attempt to restructure insurance service provision in Nigeria like never seen before. On June 01, this year, the insurance sector kicked off a rebranding campaign aimed at creating awareness on the benefits inherent in the consumption of insurance products. The campaign is a three (3) year project that will be delivered in phases. We believe the industry will be able to reach Nigerians who are hitherto unreached and thus have no access to insurance in every nook and cranny of the country. Our special guests, gentlemen of the press, ladies and gentlemen. In conclusion, let me re-emphasize that the Commission recognizes financial inclusion as a tool for financial development and inclusive growth agenda and will therefore, continue to support the development of products that will improve the standard of living of the people and increase the role of insurance in the development and growth of the average Nigerian’s standard of living. I dare say that financial inclusion, with emphasis on insurance is the collective responsibility of all. I will therefore, enjoin you all to support the collective drive of the insurance sector as we forge ahead in creating an enabling and sustainable environment for insurance penetration and increasing access to financial services and products. Thank you and while wishing successful deliberations, I welcome you again.